Each fall, we sing the praises of fall allium and autumn crocus blooms. This year, however, a special mention must be made for the glorious gladiolus! Especially the delicate, 4-inch salmon pink flowers of the salmon gladiolus (Gladiolus oppositiflorus spp. salmoneus). 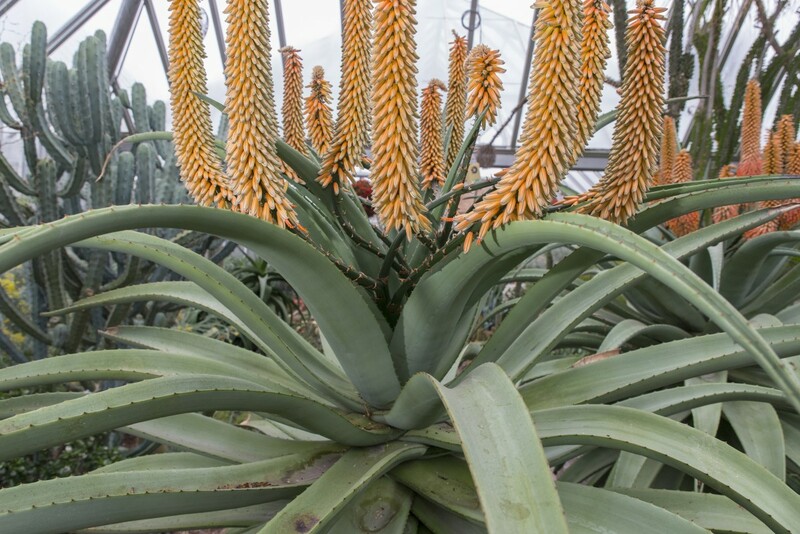 Hailing from the summer rainfall areas of the cold, higher elevations of the Drakensberg Mountains of South Africa, this beautiful wild species has proven amazingly hardy in the Chicago Botanic Garden’s Graham Bulb Garden over the last five years—including a couple of winters with record-setting cold temperatures! Gladiolus oppositiflorus ssp. salmoneus produces elegant, upright flower stalks that do not require staking! 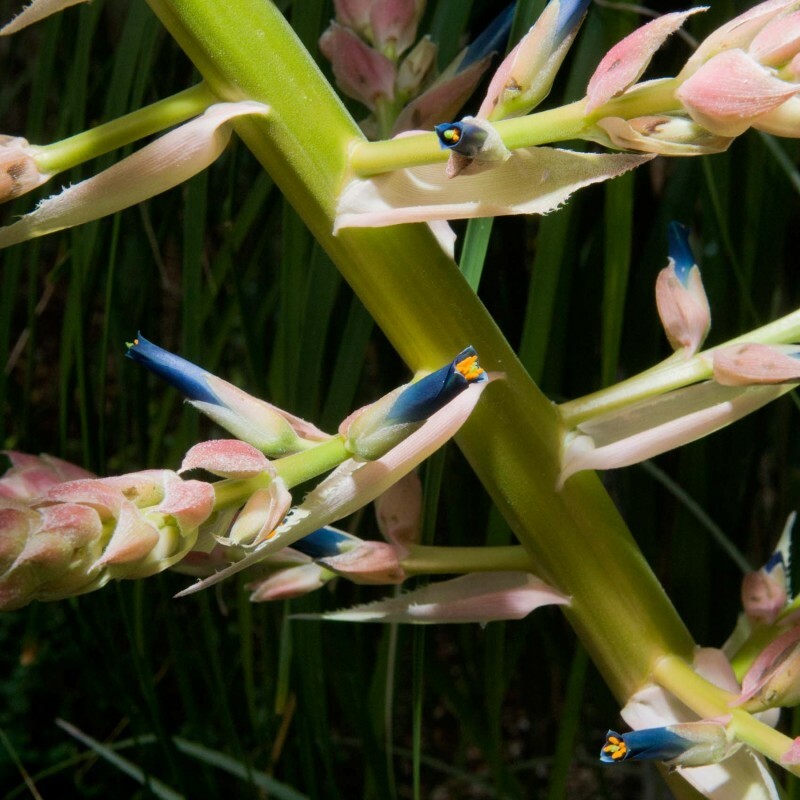 Two characteristics of its native habitat nominated the gladiolus for trial at the Garden: first, it is a winter-growing bulb in South Africa, which translates to summer growth in North America. 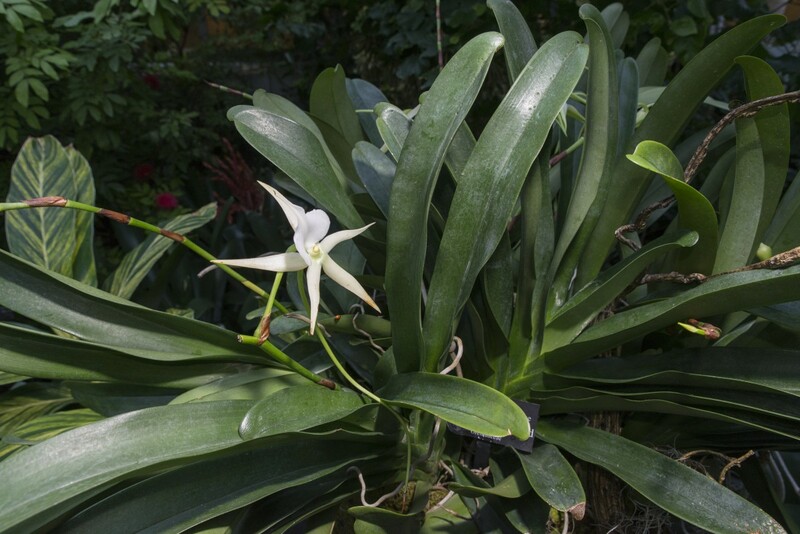 Second, this plant thrives in moist soils in grassy areas—it was perfect for the site we chose in the Bulb Garden. Based upon its initial success in our plant trial program, other gladiolus (also currently in full flower) were added to the trials. We’ve also discovered that these wild species thrive and multiply in well-drained soils (but do not tolerate flooded soils). The beautiful, red-flowered Gladiolus saundersii is also native to the Drakensbergs, but from a higher, colder, and snowier habitat. And a third selection is probably a close relative of Gladiolus dalenii var. primulinus. 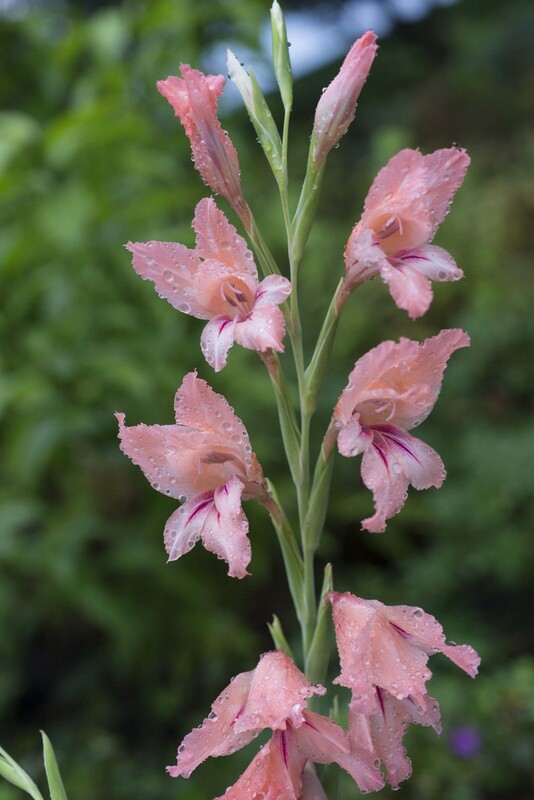 Discovered in an old, abandoned farmstead in North Carolina, and sold under the name ‘Carolina Primrose’, this gladiolus generally blooms in July and early August (although it is still blooming now). All have come through the record-breaking cold of the last couple of winters. Gladiolus is the largest genus in the Iridaceae (iris plant family) with 255 species worldwide; 166 of them in southern Africa. 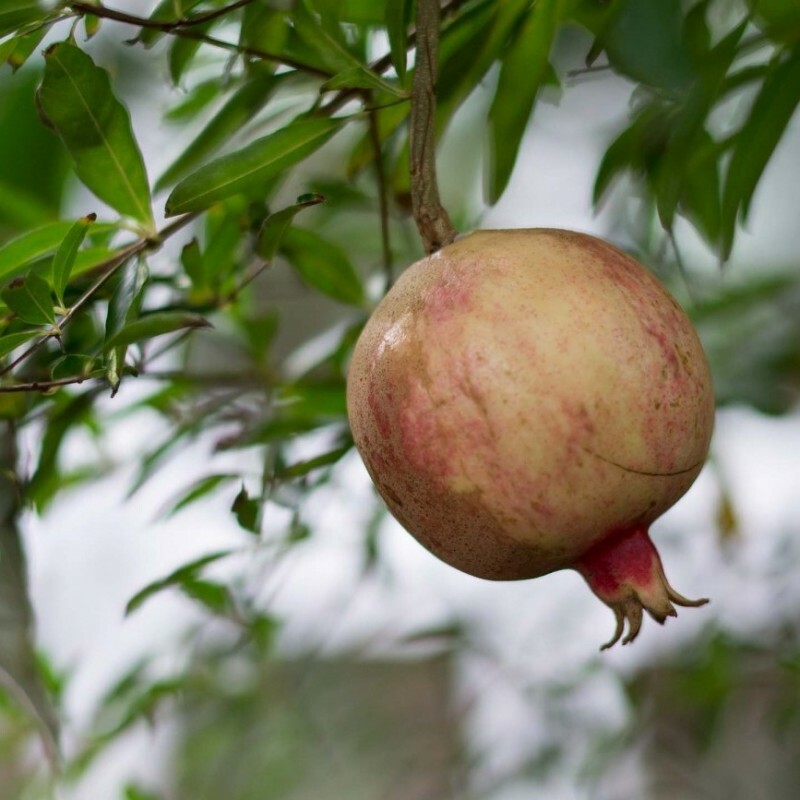 The genus was given its name by Pliny the Elder, in reference to the size and shape of the leaves, which are similar in shape and size to a short sword favored by Roman-era gladiators: the gladius. It’s not easy to find commercial sources for these bulbs, but it’s well worth the effort to obtain an elegant, refined, fall-flowering, and hardy gladiolus. A Titan Leaf or a Titan Bloom? 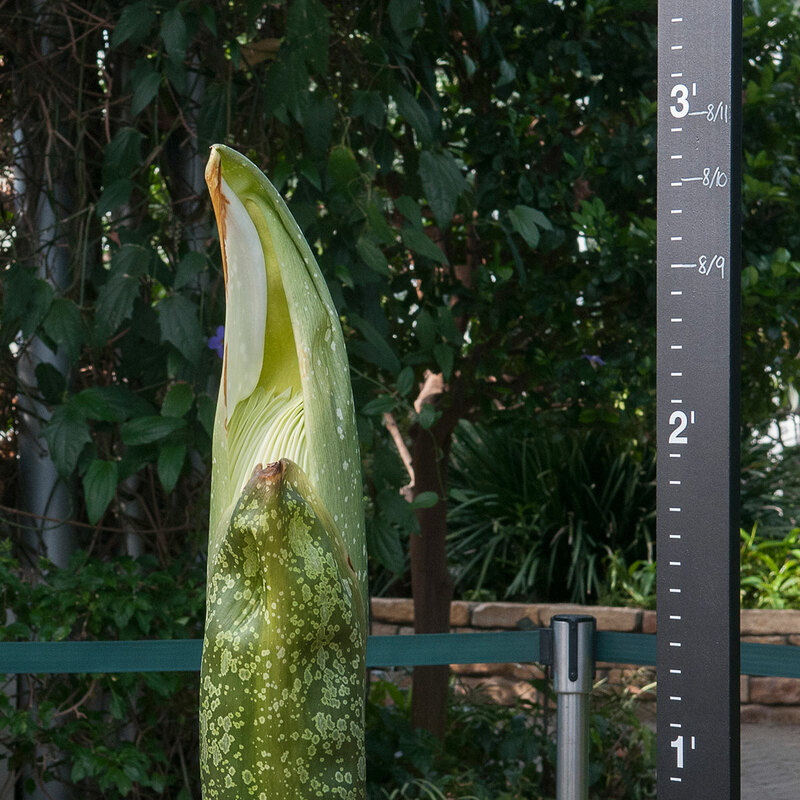 “Titan Tim” Pollak here, with today’s update on Spike, our first-ever corpse flower. 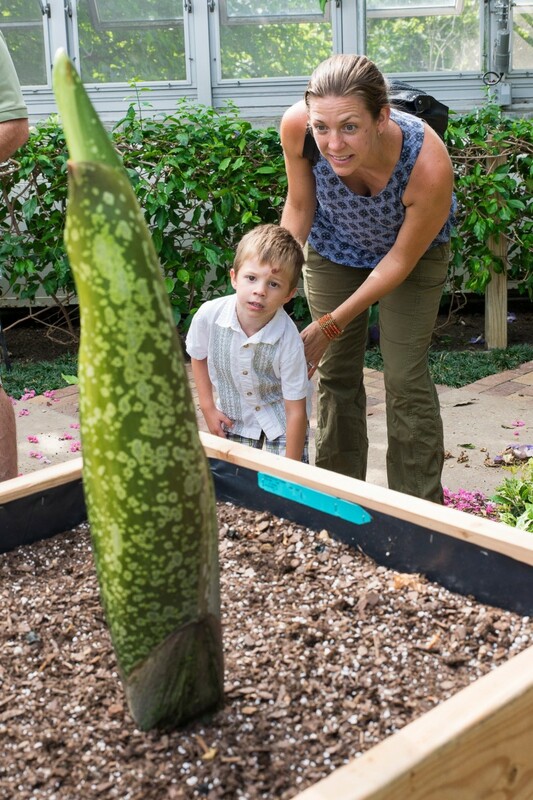 The corm of an Amorphophallus titanum: after a dozen or so years, it’s large enough to produce a bloom! How could we tell that Spike was going to be a flower? It’s tricky. Even the most experienced botanists have a hard time determining whether a titan arum shoot is a flower or a leaf at first. But soon enough, the clues start to add up. An Amorphophallus titanum shoot to the right of a leaf stalk provides comparison for determining the slight bulge, which could mean a flower bud. 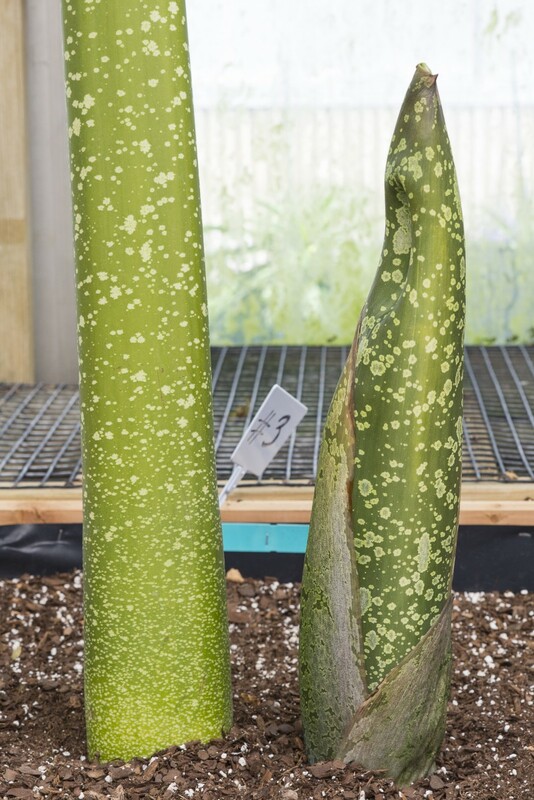 The emerging Amorphophallus titanum plant looks leafy, unlike the smooth spadix that emerges from a flower bud. Spike is 12 years old. 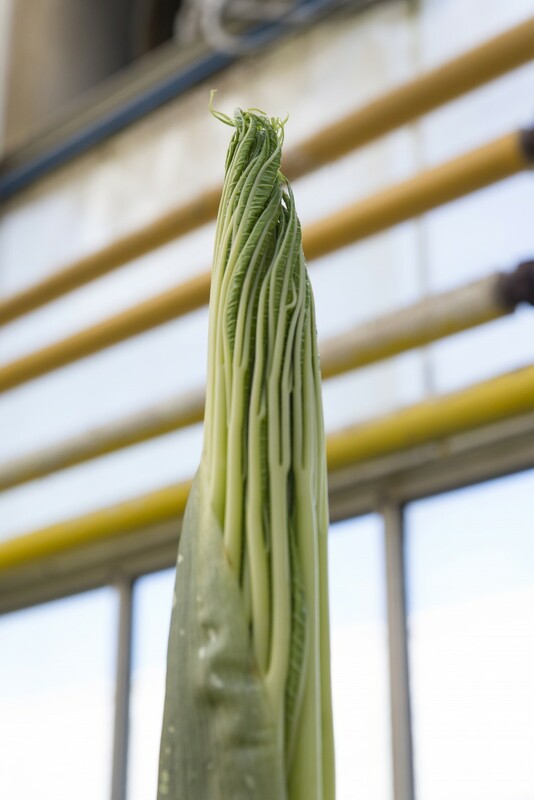 We know from other botanic gardens and conservatories that titan arums take a decade or more to send up their first flower shoot. We’ve been tending to this corm for about 12 years, so the timing was right. Is the corm big enough? The smaller the corm, the less power it has stored to send up the titan’s huge flower. This corm is about the size of a beach ball—definitely an appropriate size for flowering. A bulge at the base. It’s subtle, but a slight swelling at the base of the newly emerged shoot signaled something different than a leaf. A little off center. At 18 to 20 inches tall, we noticed a telltale sign: the tip of the shoot was off-center. While leaf shoots are true to center, we knew that a flower shoot powers up in a slightly different way. Again: it’s subtle but telling! Horticultural intuition. Both Deb Moore—our indoor floriculturist who tends to our nine titan arums—and I felt that the overall look of the shoot was different than what we’d experienced before with shoots that become a leaf. (While the titan’s non-bloom form may look like a stalk with multiple leaves, it is actually a single, giant leaf!) 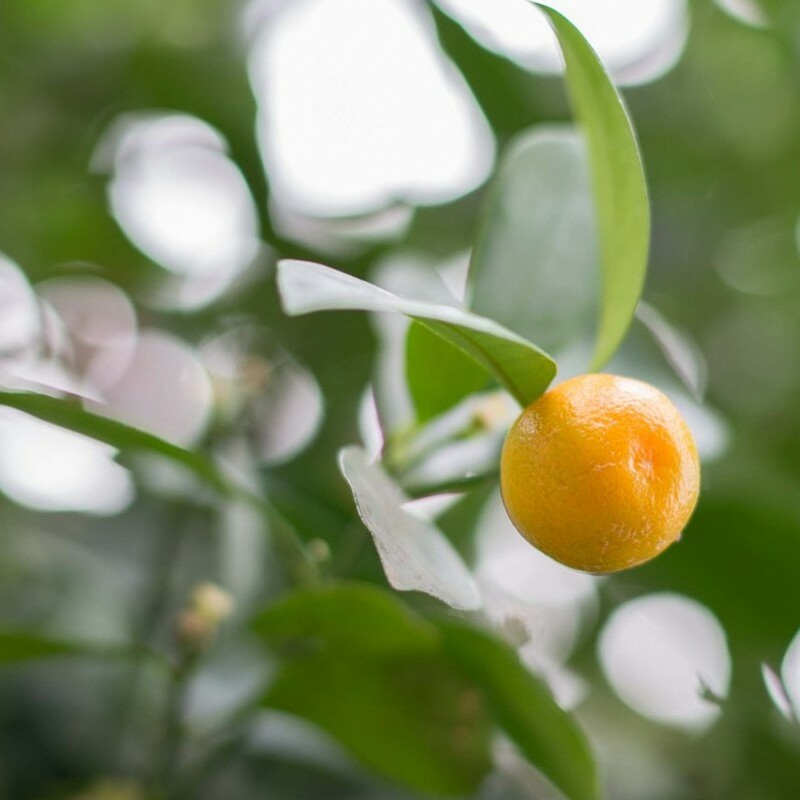 Like every gardener, you develop a sense for what’s “normal” and what’s not when it comes to your plants. We both thought that this shoot was somehow different, and it was! 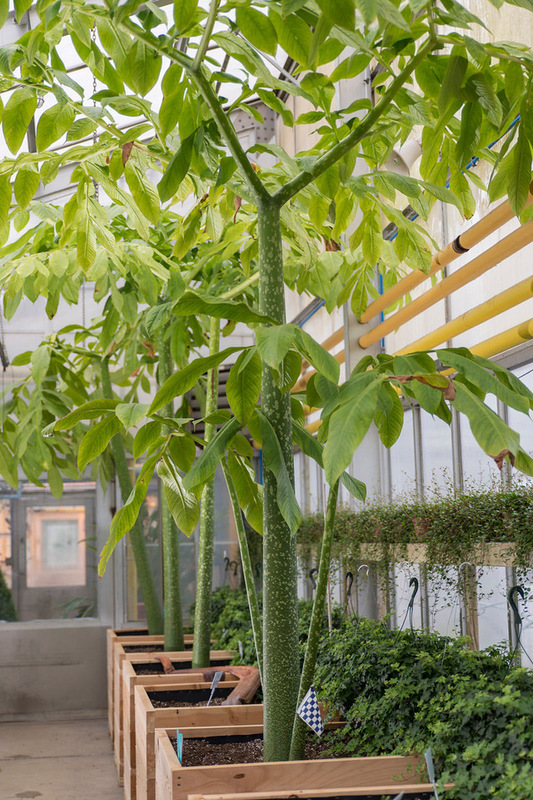 While these may look like branches and leaves, each of these Amorphophallus titanum are actually single-leaf plants. Our final “sign” was to ask the experienced titan growers from other institutions. We called upon the folks at the Huntington Library, Art Collections, and Botanical Gardens in San Marino, California; Smithsonian Gardens in Washington, D.C.; Phipps Conservatory and Botanical Gardens in Pittsburgh, Pennsylvania; and Missouri Botanical Garden in St. Louis, Missouri, for their opinions and expertise. Their final confirmations gave us the thumbs up to go public with the big news that Spike would soon blast into bloom! Like first-time parents, we are learning as we go. I can’t tell you how excited we all are in the production greenhouses—it’s a thrill to watch a plant that you’ve tended for so long finally get ready to flower! Visitors’ anticipation is rubbing off on us, too—we’ll be standing right next to you as the titan arum heads into its big night of bloom! Posted on August 11, 2015 Author Tim PollakCategories Behind the ScenesTags #CBGSpike, amorphophallus titanum, corpse flower, titan arum, what's in bloom5 Comments on A Titan Leaf or a Titan Bloom? Taken yesterday (August 11, 2015), our titan arum reaches the “halfway” point in its growth chart. 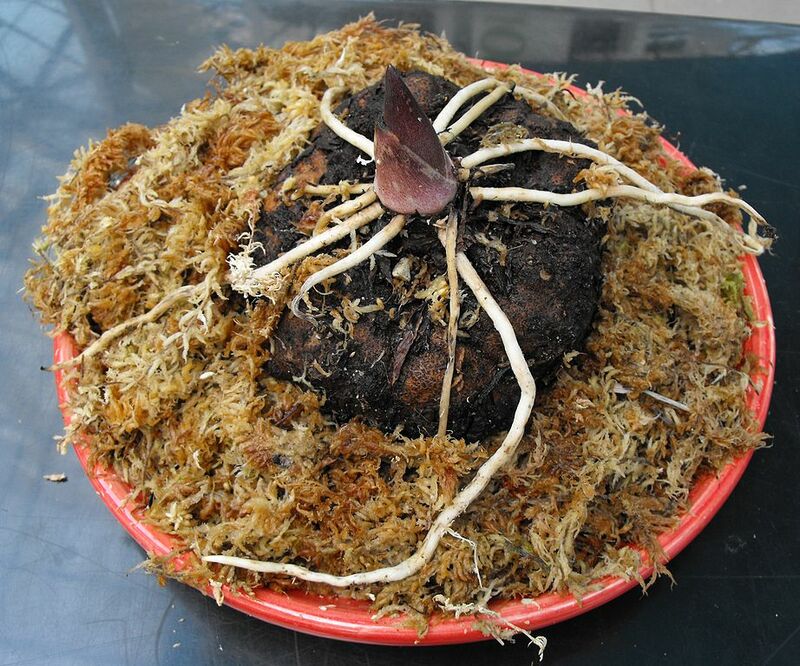 Titan arums don’t give up their secrets easily. Just as it’s difficult to distinguish a leaf bud from a flower bud (we talked about that in our last blog post), it’s hard to know when the bloom cycle has actually begun. 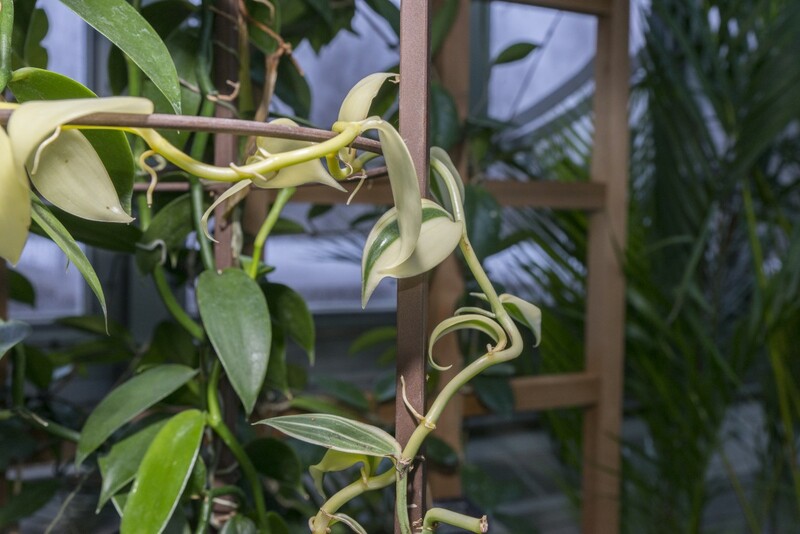 Once again, our titan-experienced friends at other botanic gardens and conservatories have offered up a few helpful hints. A close-up shows the spathe loosening from spadix of Amorphophallus titanum at the Sydney Royal Botanic Garden two days before opening (in 2008). Growth slows. Spike is powering up 4 to 6 inches per day. As a titan gets ready to open, that growth rate slows noticeably. 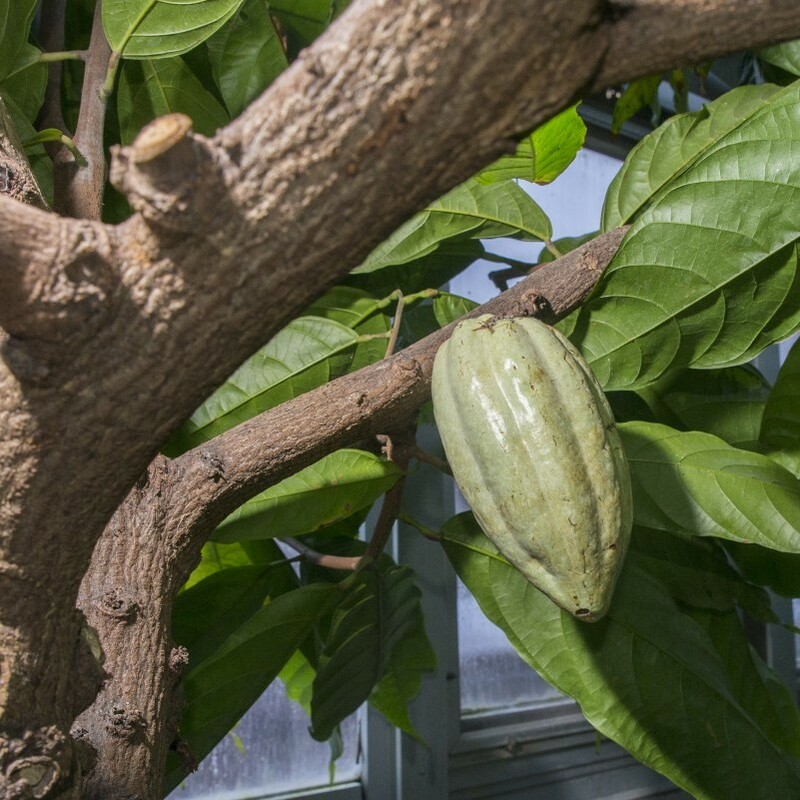 It’s a rather obvious clue, but by the time the plant is 6 or 7 feet tall, you start to marvel at the overall size and forget about incremental daily growth. We’re posting our measurements daily here, so heads up when you notice the numbers getting smaller. Bracts fall. What? Look down at the base of the spathe. Two modified leaves called bracts encircle the spathe. As Spike gets taller, these protective bracts shrivel and dry up. About a day before full bloom, they fall off—first one, then the other. That’s a sure sign that bloom is about to happen. The spathe loosens. 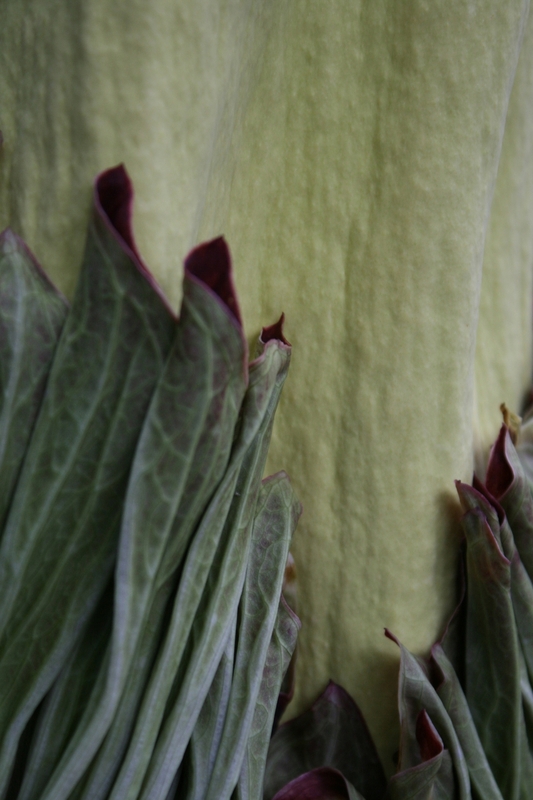 Tightly wound around the towering spadix as it shoots up, the frilly leaf called a spathe starts to loosen its grip as bloom time nears, revealing the crazy-beautiful maroon color inside. Posted on August 11, 2015 August 13, 2015 Author Tim PollakCategories Behind the ScenesTags #CBGSpike, amorphophallus titanum, corpse flower, titan arum, what's in bloom15 Comments on Is Spike Blooming Yet? 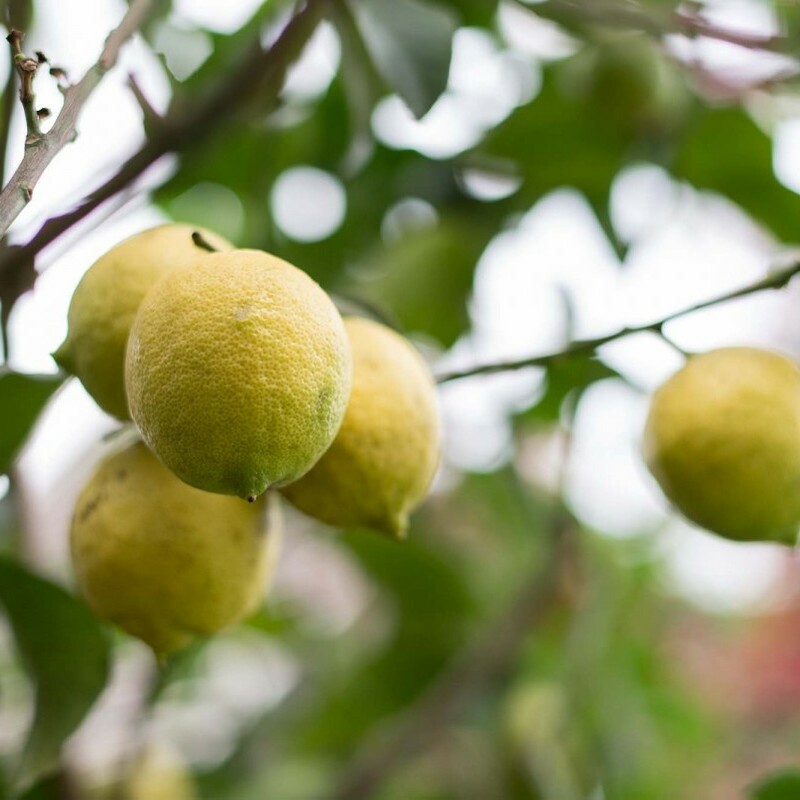 In gardening, as in life, patience is a virtue. Twelve years ago, the Garden embarked on a mission to bring a rock star of the plant world to the Chicago Botanic Garden. The titan arum (Amorphophallus titanum), also known as the corpse flower, is the largest flowering structure in the world. 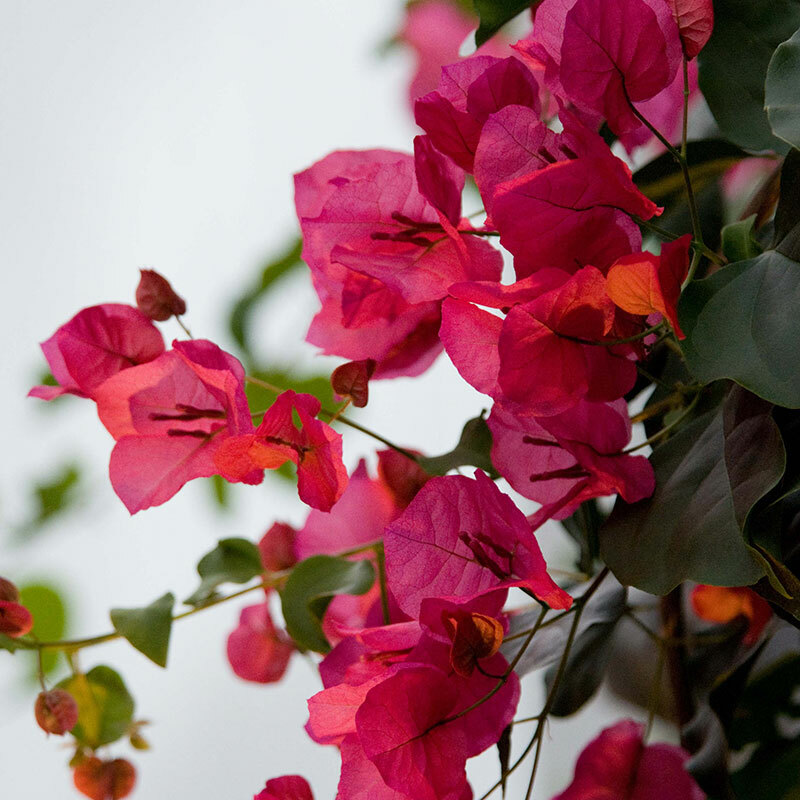 When it blooms, it puts on a show like no other. Huge. Rotten. Rare. Watch our video on YouTube of Spike moving to his display location. Why the big stink? During the peak of its bloom, which could happen in the next two weeks, the titan arum will emit a foul odor that pollinators can detect from about an acre away. Who would want to miss that? Native to the rainforests of western Sumatra, Indonesia, the titan arum is distinguished by its large size, odd shape, and terrible stench (hence its common name, corpse flower). Plants bloom for a single day every seven to ten years, and it is nearly impossible to predict the day it will be at the peak of bloom. When those magical hours finally occur, the bloom unfurls into a dramatic, blood red “flower” with a nauseating stench that can be detected up to an acre away. It’s a once-in-a-lifetime experience. 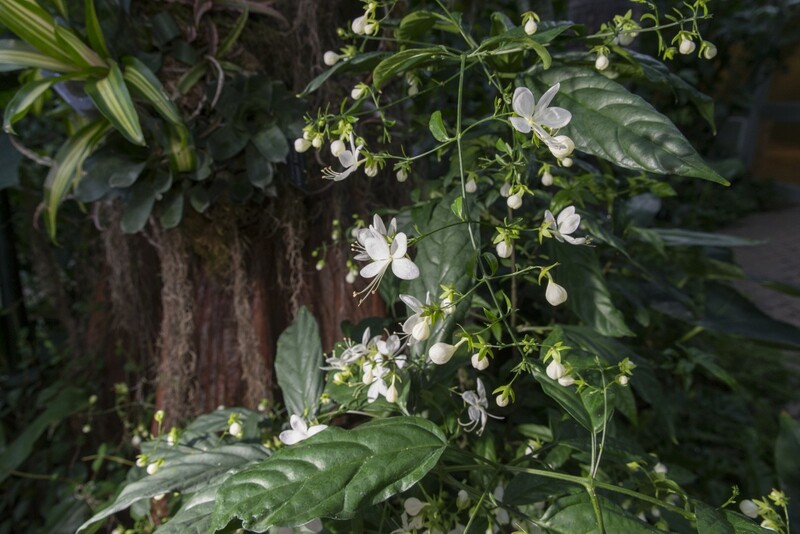 We have been cultivating eight of these mysterious plants behind the scenes in the production greenhouses, watching them grow foliage each year, and guessing what a flower might look like as it emerges. Come welcome Spike, and join the countdown to the big bloom! If you do, let us know what you think in comments here, via Twitter, Instagram, Facebook or Tumblr. 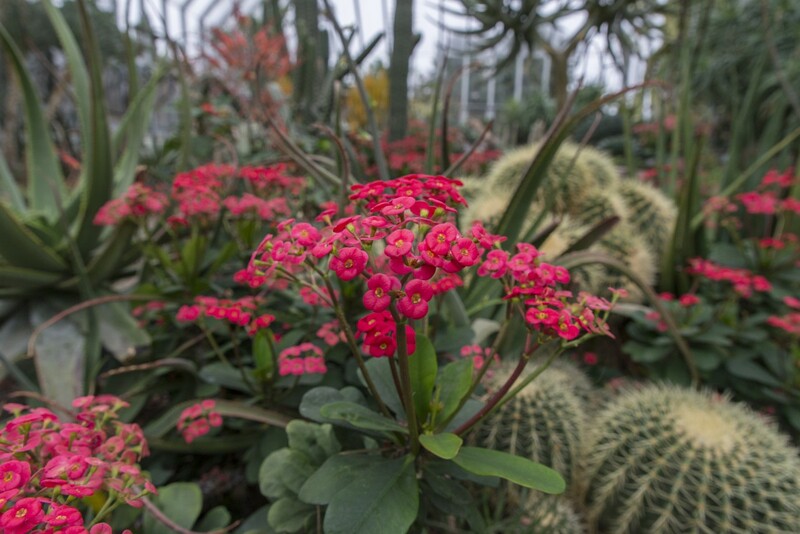 Use the hashtag #CBGSpike and our handle @chicagobotanic. Posted on August 6, 2015 September 29, 2015 Author Tim PollakCategories Behind the ScenesTags #CBGSpike, amorphophallus titanum, corpse flower, titan arum, what's in bloom14 Comments on What’s that smell?